Named for its sweet citrus and gardenia-like fragrance which can be detected in the early evening, the Lady of the Night Orchid is a widespread and well-known orchid. 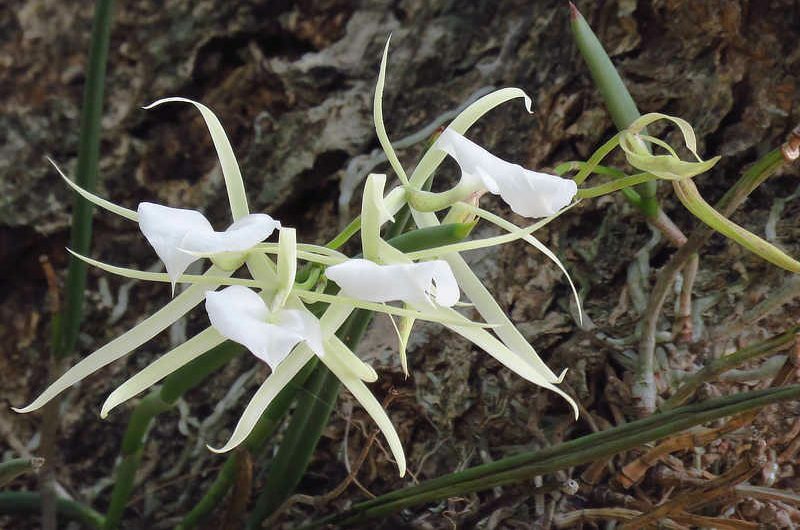 This relatively small, epiphytic orchid has whitish-green flowers with a prominent flat lip spanning up to 7 cm wide and 5 thin, greenish tepals making it a rather striking orchid. Its leaves are thin and long, partially covered with a sheath from the base. It usually grows in clumps 40-50 cm wide with 1-7 flower clusters at a time, and it can bloom throughout the year. A combination of its fragrance and whitish-green color attracts moths at night, its primary pollinator, although it is potentially self-fertilizing as well. This hardy, tough orchid is found from Mexico through Central America, the West Indies and into northern South America, and throughout its range can be found in a wide variety of habitats including mangroves, trees and exposed rock cliffs. It is a popular ornamental orchid and is often hybridized in cultivation by orchid enthusiasts. It can be found throughout Panama and is seen around the Canopy Family lodges.